Above you see the results of my faking it. There has been a particularly good looking eggplant staring at me accusingly from the vegetable bin in the refrigerator. It should have been topped with a delicious béchamel sauce and all the accoutrements of a real “Moussaka.” With two sick children and a really convoluted schedule for the last few days, I wasn’t up to the challenge. Still, it was a really pretty eggplant… so I faked a dish. The Easy and Elegant Life Greeked Eggplant and Lamb for Two to Four. Cut into 1/2″ thick rounds and salt your eggplant. Spray with Olive Oil cooking spray or brush just a dab over each side. Bake in a 450ºF oven for 10 minutes a side. Heat a skillet and add 1 pound of ground lamb. Season with 1 clove of minced garlic, a quarter of a grated onion, zest of 1/2 a lemon, 1 teaspoon of dried oregano, salt and pepper. Cook until no longer pink. Set the meat aside and add 2 TBS of Olive Oil to the pan and reheat. Lay out two plates and a shallow bowl. In the shallow bowl beat one egg. In the first plate add about 1/2 cup of flour. In the second add an equal amount of Panko breadcrumbs. Dip an eggplant slice into the egg, coat lightly with flour and then Panko. Fry each slice until golden brown on both sides. Layer in a shallow, oven proof casserole a bed of the eggplant, topped with lamb mixture and a healthy dollop of prepared spaghetti sauce. Top with the second layer of eggplant, more sauce and some crumbled feta cheese. Spray the whole with some more Olive Oil cooking spray. Either broil the result for 4 minutes (until the cheese looks a little brown) or bake in a 350ºF oven for 20-25 minutes. Served with Romaine leaves and a light balsamic vinaigrette dressing and a dry red wine. 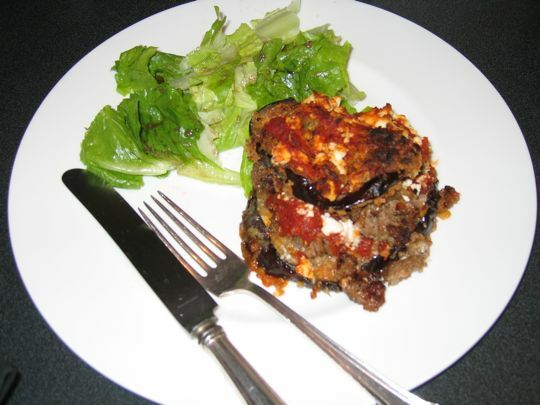 This entry was posted in Living and tagged eggplant recipes, Greek food, Panko breadcrumbs. Bookmark the permalink. Oh, a favorite which I ordered at my friend Mary Pappas’ Greek Restaurant in San Diego, Athen’s Market! Wonderful dish!! I will have to try ground lamb for sure. I’ve been using Panko now for a while and I like the results. In a pinch I’ll run half a baguette through the food processor and make my own breadcrumbs – great results. Where was this last week, before I gave away my latest load of eggplant??! !